Will Frances Hardinge ever write a book I won’t like? The leaves were cold and slightly clammy. There was no mistaking them. She had seen their likeness painstakingly sketched in her father’s journal. This was his greatest secret, his treasure and his undoing. The Tree of Lies. Now it was hers, and the journey he had never finished stretched out before her. These are all truths. But they are partial truths because this book is not one thing or another. 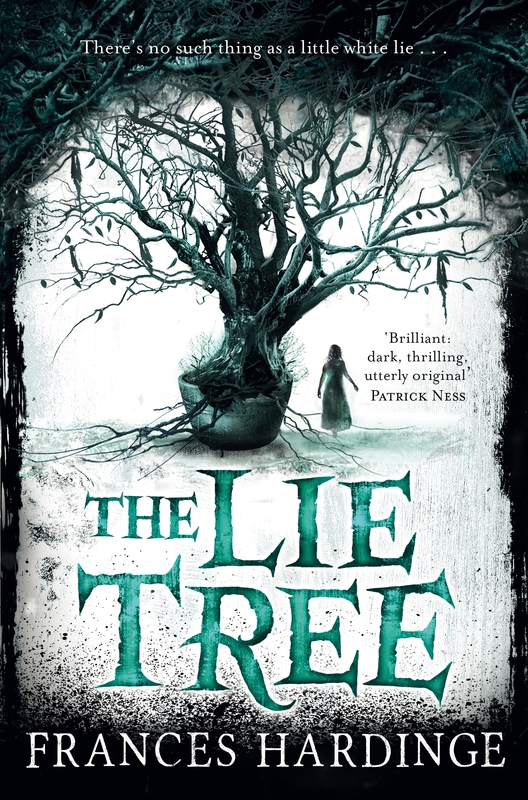 Just like all of Frances Hardinge’s books before this, The Lie Tree is a complex narrative of subtle interwoven storylines that are surprising, dark, sad and incredibly beautiful. In fact, I’d say this is Hardinge’s most beautiful book to date. That sort of beauty that comes from things that are so real they feel make you like your heart has been pierced. But in the nicest way possible. As the story starts, Faith’s family is moving to a small island, away from everything they know so that Faith’s father can work at a new fossil excavation. At first greeted with the fanfare an honourable guest deserves, things turn sour very soon when whispers of her father’s possible fraudulent actions reach their retreat. All of a sudden, no one wants to talk to the family. And then, Faith’s father turns up dead. I wondered if I was looking at it wrong. Because if we look at the realest aspects of story which describe events that really did happen, thoughts that people did believe, it is easy to be struck by how surreal they read. Because in truth, the further removed we are in time, the more history sounds fantastical to us. In a way, everything about The Lie Tree could be seen as fantastical, especially with regards to gender. But then again: no. Better not to reduce what was very real and very painful to flights of fancy. At the centre of Faith’s life is the dichotomous separation between her father and mother. She is incredibly loyal to her genius father, a prestigious Natural Scientist just as she completely disdainful of her mother, Myrtle, a lady who uses her looks to get what she wants. It’s the Victorian era and this division of roles and the perceived inherent quality that separates them is at the core of The Lie Tree. Faith’s long journey to understanding both her father and her mother is one of the main focus of the book. And that journey is interspersed with encounters with a plethora of other ladies. At first Faith’s viewpoint is coloured by her own internalised acceptance of narratives surrounding women. To wit: in the beginning everything is her father and everything is male centric, intelligence and knowledge are relegated to menfolk. The more the story progresses, the more this changes. All of a sudden the women are there, have been there all along and they are something else altogether. Queer ladies, villainous ladies, adapting ladies, awesome ladies, accepting ladies, angry ladies. Myrtle, I adore you. You’re review is perfect! I’ve been struggling with how to really describe the book to friends who MUST read it! I’ve been mostly reading on my Nook recently, however after this review The Lie Tree has gone straight in my Amazon basket. This sounds like a keeper!